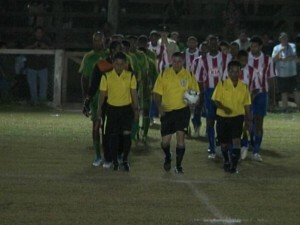 Week three in the PLB brought a monster showdown inside the Isidro Beaton Stadium Saturday night as the Belmopan Bandits hosted the front running team in Zone B, Police United in what promised to be a keen contest. The Bandits came in ready fort the World and in the opening minute, looked to strike quickly when Ronaldo Alvarez fires this volley at Japheth Young who mishandles the pill which provides 2 more atemmpts that the Bandits fail to convert. The team continues to press the action and this deflection off the spotkick gets Ronaldo Alvarez another chance to score and he just misses the target. Police United finally gets some offense going when Lennox Castillo mounts this individual effort off the left wing but fails to deliver a centre that would get past Woodrow West. It’s Police United again on the attack and this defensive error gives Jarret Dennis a one on one opportunity against West in which he disappoints terribly. Jacinto Bermudez then gets this nice look at the Police goal however, this launch was always rising. We’re in 2nd half action when Alden Coleman gets this chance to impact the ballgame only to be embarrassed by a nice recovery from Oswald Young. At the 76th minute, the ballgame was descended in form and skill whne Devon Makin fires this grasshead burner in heavy traffic that beats the diving Woodrow West to give Police a 1-zip lead. The Bandits look for the reply off this corner kick launched by Kareem Haylock, but Japhet Young does well to get this ball out of harm’s way. Again the Bandits look for the equalizer when this ball is kept alive to Mark Leslie but the heel play turns out to be a high riser. Folks it was not a well played ballgame, but Police United takes the 1-zip win anyway to become the only team with a perfect record in week 3 in all of the PBL. In other Zone B Matches, Juventus banked World FC 3-nil on a hat trick from Osmar Duran while San Ignacio United doubled Hankook Verdes 2 to 1 on a pair of goals from Victor Morales. 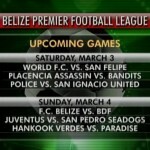 Placencia Assasins punished Paradise Freedom Fighters in a 5-1 onslaught. Thus Police United leads Zone B with a perfect 9 points, San Ignacio is next with 7, Placencia has 6, the Bandits show 4 while Hankook Verdes and Paradise Freedom Fighters are yet to post a win or even a draw. Over in Zone A, FC Belize and San Pedro Sea Dogs settled for a scoreless stalemate, Juventus blanked World FC 3-nil on a hat trick by Osmar Duran while FC Felipe Barcelona burned the B.D.F. on a goal from Gabriel Perez. 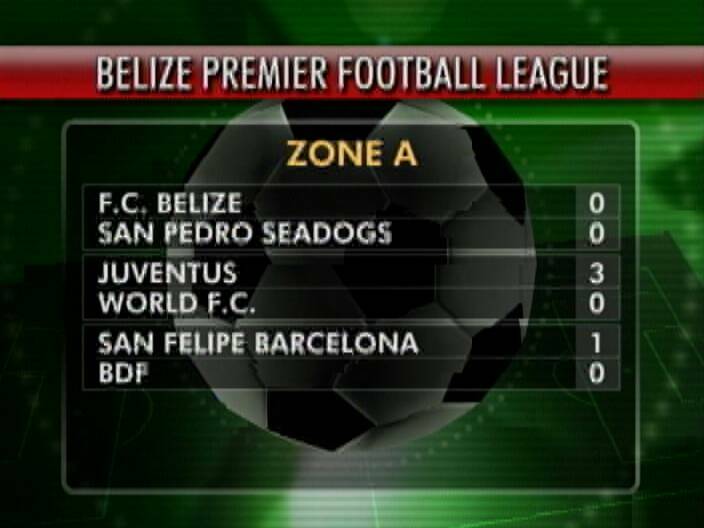 The standing in Zone A shows the San Pedro Sea Dogs, San Felipe Barcelona and FC Belize all with 5 points in that order due to goal differential. Juventus has 4 points and so does B.D.F. while World FC shows no points after 3 outings. 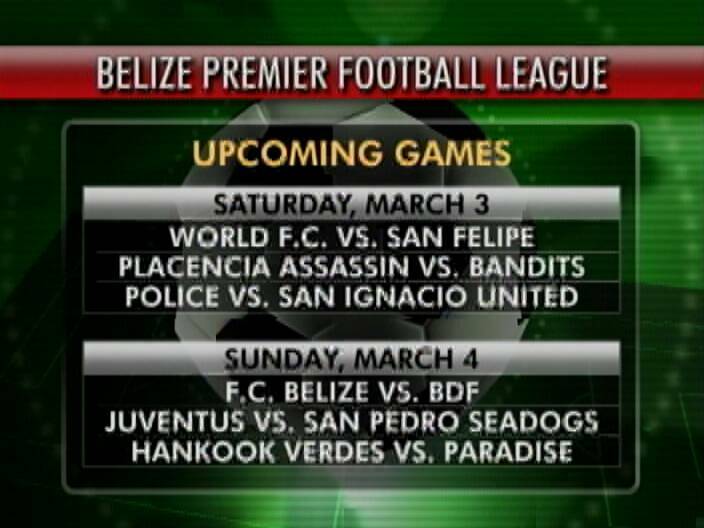 This weekend schedule looks like this on Saturday at 7:30 p.m. World FC will host San Felipe Barcelona at the Norman Broaster, Placencia Assassins travel to Belmopan bandits and Police United will be at the MCC Grounds against San Ignacio United. 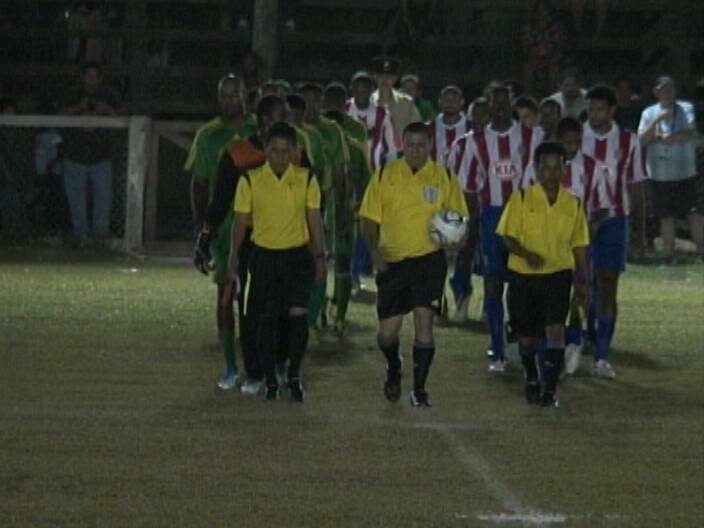 On Sunday, FC Belize faces the B.D.F. at the MCC Ground. Juventus takes on San Pedro Sea Dogs at the People’s Stadium and Hankook Verdes heads to the Toledo Union Field for a take with Paradise Freedom Fighters in a battle of teams looking for their 1st points of the season. 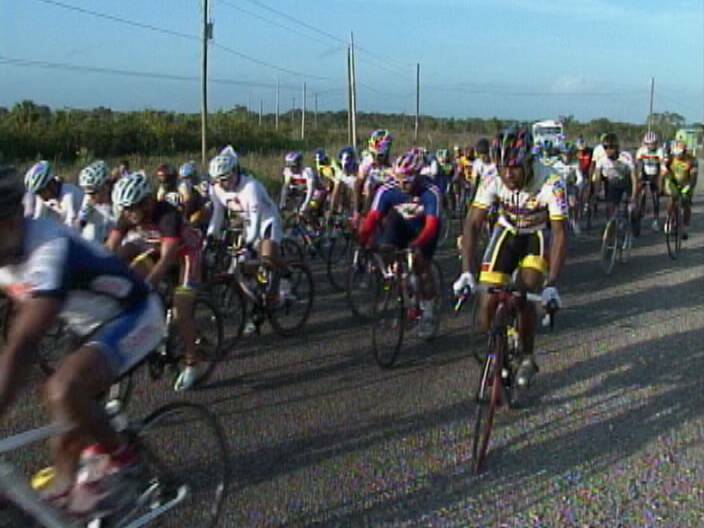 Turning to the cycling scene, the C-Ray Cycling Team presented a 30 mile race on the Boom Circuit on Saturday that attracted over 50 riders including some of the big names in the sport as they ready themselves for the 2012 Cross Country. At the turn around point in Hattieville, we have 5 man breakaway lead by the Mexican Donesetti Vasquez. And this is a look at the main pelathon as round the circular to head back for the finish. When we rejoin the race on the return at Fresh Pond, it’s Kenroy Gladden grabbing that premie from the 3 man lead that includes Donesetti Vasquez and Leroy Cassasola. Now here’s the sprint to the tap andf its the Mexican Vasquez with the early lead but Leroy Cassasola of Santino’s will not quit and surges to grab the Win forcing Donesetti Vasquez of Depredadores into 2nd while a vastly improved Kenroy Gladden pulls up 3rd. Meanwhile for a 3rd time this year, Kaya Cattouse forced Shalini Zabaneh into 2nd place and Riss Cattouse prevailed in the Junior Category. Was stolen vehicle linked in murder of Benito Mendoza in Belmopan?